Lack of an accurate, easy-to-use, and portable platform to facilitate early disease detection. In the field of periodontology, traditional clinical criteria are often insufficient for determining sites of active disease, for monitoring the response to therapy or for measuring the degree of susceptibility to future disease progression. Saliva as a mirror of oral and systemic health is a valuable source for clinically relevant information because it contains biomarkers specific for the unique physiological aspects of periodontal diseases. The fluid mostly collected for salivary diagnostic purpose is expectorated whole saliva, a mix composed largely of the secretions from the major salivary glands along with the modest contributions from the minor salivary glands and gingival crevicular fluid. The various salivary biomarkers are as follows. Specific immunoglobulins in saliva directed toward periodontal pathogens have also been examined for their diagnostic potential. Eggert et al. reported that saliva from treated periodontitis patients had higher IgA and IgG levels to periodontal pathogens porphyromonas. gingivalis and Treponema. denticola than as compared to saliva from control subjects. Sandholm et al. found increased concentrations of salivary IgG to Aggregatibacter. actinomycetemcomitans in patients of aggressive periodontitis. Salivary enzymes can be produced by salivary glands, oral microorganisms, polymorphonuclear leukocytes, oral epithelial cells derived from gingival crevicular fluid (GCF). Calcium (Ca) is the ion that has been most intensely studied as a potential marker for periodontal disease in saliva. Sewon et al. reported a higher concentration of Ca detected in whole stimulated saliva from the periodontitis patients. The authors concluded that an elevated Ca concentration in saliva was characteristic of patients with periodontitis. proteins: A number of studies have examined the correlation between nonenzymatic, nonimmunoglobulin proteins in saliva and periodontal disease. Cystatins (cysteine proteinases) are proteolytic enzymes originated from pathogenic bacteria, inflammatory cells, osteoclasts, and fibroblasts. These enzymes have collagenolytic activity, which may cause tissue destruction. Cystatins are physiological inhibitors of cysteine proteinases, and may function by modulating enzyme activity in the periodontium. The number of leukocytes in saliva varies from person to person, and the cell counts vary for an individual during the course of the day. The majority of salivary leukocytes enter the oral cavity via the gingival crevice. Klinkhammer  standardized collection and counting of leukocytes in saliva and developed the orogranulocytic migratory rate (OMR). Raeste et al.,  in their study, indicated that the OMR reflects the presence of oral inflammation, and suggested that this measure can be used as a laboratory test. Volatile sulfur compounds, primarily hydrogen sulfide and methylmercaptan, are associated with oral malodor. Salivary volatiles have been suggested as possible diagnostic markers and contributory factors in periodontal disease. As GCF traverses through inflamed periodontal tissues en route to the sulcus, biological molecular markers are gathered from the surrounding areas and are subsequently eluted into whole saliva. Many different biomarkers associated with bone formation, resorption, and turnover, such as alkaline phosphatase, osteocalcin, osteonectin, and collagen telopeptidases, have been evaluated in GCF and saliva. These mediators are associated with local bone metabolism as well as with systemic conditions. Matrix metalloproteinases (MMP): They are host proteinases responsible for both tissue degradation and remodeling. During progressive periodontal breakdown, gingival and periodontal ligament collagens are cleaved by host cell-derived interstitial collagenases. MMP-8: It is the most prevalent MMP found in diseased periodontal tissue and GCF. Recently, the level of MMP-8 was demonstrated to be highly elevated in saliva from patients with periodontal disease using a rapid point-of-care microfluidic device. Studies are required to evaluate MMP-8, either alone or in conjunction with other molecular biomarkers, to predict the risk of future disease occurrence and to monitor treatment interventions. Gelatinase (MMP-9): Another member of the collagenase family, is produced by neutrophils and degrades collagen intercellular ground substance. In their study, Teng et al. found a twofold increase in the mean MMP-9 levels in patients with progressive attachment loss. Given these results, future use of MMP-9 in oral fluid diagnostics may serve as a guide in periodontal treatment monitoring. Telopeptide: Given the specificity and sensitivity for bone resorption, pyridinoline cross-links, such as pyridinoline cross-linked carboxyterminal telopeptide of type I collagen represent a potentially valuable diagnostic aid for periodontal disease. Several investigations have explored the ability of pyridinoline cross-links to detect bone resorption in periodontitis as well as in response to periodontal therapy. , These studies assessing the role of GCF carboxyterminal telopeptide of type I collagen levels as a diagnostic marker of periodontal disease activity have produced promising results to date. Carboxyterminal telopeptide of type I collagen has been shown to be a promising predictor of both future alveolar bone and attachment loss. Controlled human longitudinal trials are needed to establish fully the role of salivary carboxyterminal telopeptide of type I collagen as a predictor of periodontal tissue destruction, disease activity and response to therapy in periodontal patients. Osteocalcin: Elevated serum osteocalcin levels have been found during periods of rapid bone turnover, such as in osteoporosis and multiple myeloma and during fracture repair. Therefore, studies have investigated the relationship between GCF osteocalcin levels and periodontal disease. Saliva may constitute a first line of defence against free radical-mediated oxidative stress, since the process of mastication promotes a variety of such reactions, including lipid peroxidation. Moreover, during gingival inflammation, gingival crevicular fluid (GCF) flow increases, adding to saliva with products from the inflammatory response. This is why the antioxidant capacity of saliva is of increasing interest. The use of saliva for translational and clinical application has emerged at the forefront. Most relevant to periodontal diseases are the emerging toolboxes of the salivary proteome and the salivary transcriptome for early detection, disease progression, and therapeutic monitoring. Using these emerging technologies, it has been shown that salivary proteins and RNAs can be used to detect oral cancer , and Sjogren's syndrome. The stage is now poised to use these technologies for translational and clinical applications in periodontal diseases. Salivary proteome: The proteome is the protein complement of the genome, and proteomics is analysis of the portion of the genome that is expressed. The proteomes in body fluids are valuable due to their high clinical potential as sources of disease markers. 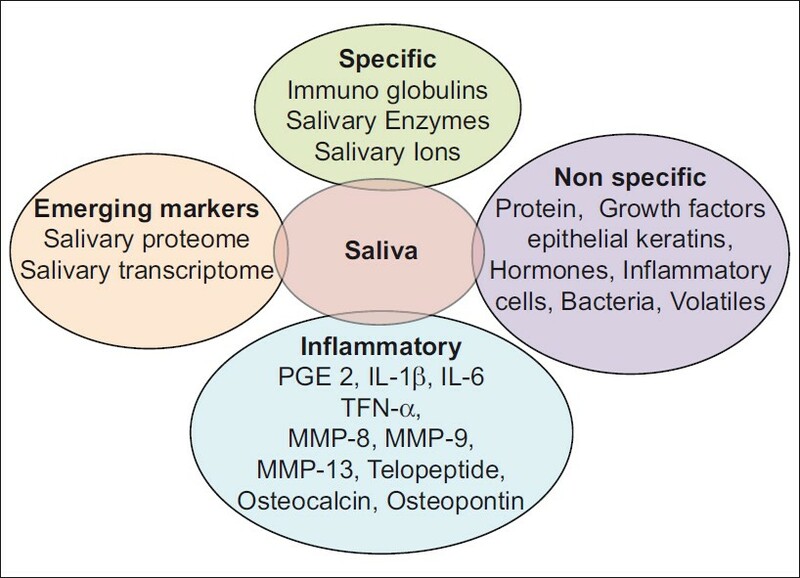 In principle, a global analysis of the human salivary proteomes can provide a comprehensive spectrum of oral and general health. Furthermore, analysis of salivary proteomes over the course of complications may unveil morbidity signatures in the early stage and monitor disease progression. Significant progress has been made in cataloguing human saliva proteins and exploring their post-translational modifications. By using both two-dimensional gel electrophoresis⁄mass spectrometry and "shotgun" proteomics approaches, Hu et al. , identified 309 distinct proteins in human whole saliva. In the field of periodontal diagnosis, there has been a steady growing trend during the last 2 decades to develop tools to monitor periodontitis. Currently, diagnosis of periodontal disease relies primarily on clinical and radiographic parameters. These measures are useful in detecting evidence of past disease, or verifying periodontal health, but provide only limited information about patients and sites at risk for future periodontal breakdown. Numerous markers in saliva have been proposed and used as diagnostic tests for periodontal disease. Ideally, diagnostic tests should demonstrate high specificity and sensitivity. Given the complex nature of periodontal disease, it is unlikely that a single marker will prove to be both sensitive and specific. A combination of two or more markers may provide a more accurate assessment of the periodontal patient. Interest in saliva as a diagnostic medium is escalating due to its many advantages over other diagnostic biofluids. Both saliva and blood serum contain similar proteins and RNA, which is why saliva is considered a "mirror to the body." Saliva is readily available which makes the collection process fairly straightforward, even when multiple samples are needed. Its collection is noninvasive, which makes the procedure more acceptable to patients and more conducive to a stress-free appointment. Many of the hazards associated with blood collection do not apply to saliva. There is no potential for cross-contamination among patients when used improperly and present a danger to health care personnel. Because of the low concentrations of antigens in saliva, HIV, and hepatitis infections are much less of a danger from saliva than from blood. Saliva is also easier to handle because it does not clot. As salivary testing becomes more commonplace, the costs could drop below those currently incurred for urine/blood sampling. However, due to the uniqueness of the technique, the analysis today is still quite expensive. Because of the simple and noninvasive method of collection, salivary diagnostic tests appear to hold promise for the future. Saliva, like blood, contains an abundance of protein and nucleic acid molecules that reflects physiological status; however, unlike other bodily fluids, salivary diagnostics offer an easy, inexpensive, safe, and noninvasive approach for disease detection, and possess a high potential to revolutionize the next generation of diagnostics. Although challenges remain ahead, the use of saliva-based oral fluid diagnostics appear promising for future application to diagnose periodontal diseases and to prognosticate periodontal treatment outcomes. The authors would like to thank Dr. Hari Menon, Dr. Abhijit Gurav, and Dr. Abhijeet Shete for thoughtful discussions, and assistance in preparation of the manuscript. 1. Lee Y, Wong DT. Saliva: An emerging biofluid for early detection of disease. Am J Dent 2009;22:241-8. 2. Mandel ID. The diagnostic uses of saliva. J Oral Pathol Med 1990;19:119-25. 3. Giannobile WV, Beikler T, Kinney JS, Ramseier CA, Morelli T, Wong DT. Saliva as a diagnostic tool for periodontal disease: Current state and future directions. Periodontol 2000 2009;50:52-64. 4. Armitage GC. Development of a classification system for periodontal diseases and conditions. Ann Periodontol 1999;4:1-6. 5. Offenbacher S. Periodontal diseases: Pathogenesis. Ann Periodontol 1996;1:821-78. 6. Sahingur SE, Cohen RE. Analysis of host responses and risk for disease progression. Periodontol 2000 2004;34:57-83. 7. Genco RJ. Current view of risk factors for periodontal diseases. J Periodontol 1996;67(10 Suppl):1041-9. 8. Kaufman I, Lamster IB. Analysis of saliva for periodontal diagnosis: A review. J Clin Periodontol 2000;27:453-65. 9. Marcotte H, Lavoie MC. Oral microbial ecology and the role of salivary immunoglobulin A. Microbiol Molecular Biol Rev 1998 ; 62:71-109. 10. Delacroix DL, Dive C, Rambaud, JC, Vaerman JP. IgA subclasses in various secretions and in serum. Immunology 1982;47:383-5. 11. Guven O, De Visscher JG. Salivary IgA in periodontal disease. J Periodontol 1982;53:334-5. 12. Sandholm L, Gronblad E. Salivary immunoglobulins in patients with juvenile periodontitis and their healthy siblings. J Periodontol 1984;55:9-12. 13. Eggert FM, Maenz L, Tam YC. Measuring the interaction of human secretory glycoproteins to oral bacteria. J Dent Res 1987;66:610-2. 14. Sandholm L, Tolo K, Olsen I. Salivary IgG, a parameter of periodontal disease activity? High responders to actinobacillus actinomycetemcomitans Y4 in juvenile and adult periodontitis. J Clin Periodontol 1987;14:289-94. 15. Jalil RA, Ashley FP, Wilson RF, Wagaiyu EG. Concentrations of thiocyanate, hypothiocyanite, ''free'' and ''total'' lysozyme, lactoferrin and secretory IgA in resting and stimulated whole saliva of children aged 12-14 years and the relationship with plaque accumulation and gingivitis. J Periodont Res 1993;28:130-6. 16. Guven Y, Satman I, Dinccag N, Alptekin S. Salivary peroxidase activity in whole saliva of patients with insulin-dependent (type- 1) diabetes mellitus. J Clin Periodontol 1996;23:879-81. 17. Sewon L, Karjalainen SM, Sainio M, Seppa O. Calcium and other salivary factors in periodontitis affected subjects prior to treatment. J Clin Periodontol 1995;22:267-70. 18. Groenink J, Walgreen-Weterings E, Nazmi K, Bolscher JG, Veerman EC, van Winkelhoff AJ, et al. Salivary lactoferrin and low-Mr mucin MG2 in Actinobacillus actinomycetemcomitans-associated periodontitis. J Clin Periodontol 1999;26:269-75. 19. Helmerhorst EJ, Oppenheim FG. Saliva: A dynamic proteome. J Dent Res 2007;86:680-93. 20. Henskens YM, van der Velden, U, Veerman ECI, Nieuw Amerongen AV. Cystatins S and C in human whole saliva and in glandular salivas in periodontal health and disease. J Dent Res 1994;73:1606-14. 21. Garito ML, Prihoda TJ, McManus LM. Salivary PAF levels correlate with the severity of periodontal inflammation. J Dental Res 1995;74:1048-56. 22. Syrjanen S, Piironen P, Markkanen H. Free amino-acid composition of wax-stimulated whole saliva in human subjects with healthy periodontium, severe chronic periodontitis and post-juvenile periodontitis. Arch Oral Bio 1984 ; 29:735-8. 23. Syrjanen S, Piironen P, Markkanen H. Free amino-acid content of wax stimulated whole saliva as related to periodontal disease. Arch Oral Biol 1987;32:607-10. 24. Syrjanen S, Alakuijala L, Alakuijala P, Markkanen SO, Markkanen H. Free amino acid levels in oral fluid of normal subjects and patients with periodontal disease. Arch Oral Biol 1990;35:189-93. 25. Wilton JM, Curtis MA, Gillett IR, Griffiths GS, Maiden MF, Sterne JA, et al. Detection of high-risk groups and individuals for periodontal diseases: Laboratory markers from analysis of saliva. J Clin Periodontol 1989;16:475-83. 26. Morgan PR, Shirlaw PJ, Johnson NW, Leigh IM, Lane EB. Potential applications of anti-keratin antibodies in oral diagnosis. J Oral Pathol 1987;16:212-22. 27. Linden GJ, Mullally BH, Freeman R. Stress and the progression of periodontal disease. J Clin Periodontol 1996;23:675-80. 28. Axtelius B, Soderfeldt B, Nilsson A, Edwardsson S, Attstrom R. Therapy-resistant periodontitis. Psychosocial characteristics. J Clin Periodontol 1998;62:482-91. 29. Chrousos GP, Gold PW. The concepts of stress and stress system disorders: Overview of physical and behavioral homeostasis. J Am Med Assoc 1992;267:1244-52. 30. Shannon IL, Prigmore JR, Brooks RA, Feller RP. The 17-hydroxycorticosteroids of parotid fluid, serum and urine following intramuscular administration of repository corticotropin. J Clin Endocrinol 1959;19:1477-80. 31. Genco RJ, Ho AW, Kopman J, Grossi SG, Dunford RG, Tedesco LA. Models to evaluate the role of stress in periodontal disease. Ann Periodontol 1998;3:288-302. 32. Schiott RC, Loe H. The origin and variation in number of leukocytes in the human saliva. J Periodont Res 1970;5:36-41. 33. Klinkhammer J. Quantitative evaluation of gingivitis and periodontal disease (I): The orogranulocyte migratory rate. Periodontics 1968;6:207-11. 34. Raeste AM, Aura A. Rate of migration of oral leukocytes in-patients with periodontitis. Scand J Dent Res 1978;86:43-51. 35. Kopczyk RA, Graham R, Abrams H, Kaplan A, Matheny J, Jasper SJ. The feasibility and reliability of using a home screening test to detect gingival inflammation. J Periodontol 1995;66:52-4. 36. Genco RJ, Zambon JJ, Christersson LA. The role of specific bacteria in periodontal disease: The origin of periodontal infections. Adv Dent Res 1998;2:245-59. 37. Socransky SS. Relationship of bacteria to the etiology of periodontal disease. J Dent Res 1970;49:203-22. 38. Slots J. Bacterial specificity in adult periodontitis: A summary of recent work. J Clin Periodontol 1986;13:912-7. 39. de Jong MH, van der Hoeven JS, van Os JH, Olijve JH. Growth of oral streptococcus species and actinomyces viscosus in human saliva. App Environ Microbiol 1984;47:901-4. 40. de Jong MH, van der Hoeven JS, van Os JH. Growth of micro-organisms from supragingival dental plaque on saliva agar. J Dent Res 1986;65:85-8. 41. Asikainen S, Alaluusua S, Saxen L. Recovery of A. actinomycetemcomitans from teeth, tongue and saliva. J Periodontol 1991;62:203-6. 42. Umeda M, Contreras A, Chen C, Bakker I, Slots J. The utility of whole saliva to detect the oral presence of periodontopathic bacteria. J Periodontol 1998;69:828-33. 43. Rosenberg M, Barki M, Portnoy S. A simple method for estimating oral microbial levels. J Microbiol Method 1989;9:253. 44. Tal H, Rosenberg M. Estimation of dental plaque levels and gingival inflammation using a simple oral rinse technique. J Periodontol 1990;61:339-42. 45. Rosenberg M, Kozlovsky A, Gelernter I, Cherniak O, Gabbay J, Baht R, et al. Self-estimation of oral malodor. J Dent Res 1995;74:1577-82. 46. Airila-Mansson S, Soder B, Kari K, Meurman JH. Influence of combinations of bacteria on the levels of prostaglandin E2, interleukin-1beta, and granulocyte elastase in gingival crevicular fluid and on the severity of periodontal disease. J Periodontol 2006;77:1025-31. 47. Kinney JS, Ramseier CA, Giannobile WV. Oral fluid-based biomarkers of alveolar bone loss in periodontitis. Ann N Y Acad Sci 2007;1098:230-51. 48. Herr AE, Hatch AV, Throckmorton DJ, Tran HM, Brennan JS, Giannobile WV, et al. Microfluidic immunoassays as rapid saliva-based clinical diagnostics. Proc Natl Acad Sci USA 2007;104:5268-73. 49. Teng YT, Sodek J, McCulloch CA. Gingival crevicular fluid gelatinase and its relationship to periodontal disease in human subjects. J Periodontal Res 1992;27:544-52. 50. Hernandez M, Valenzuela MA, Lopez-Otin C, Alvarez J, Lopez JM, Vernal R, et al. Matrix metalloproteinase- 13 is highly expressed in destructive periodontal disease activity. J Periodontol 2006;77:863-70. 51. Giannobile WV. C-telopeptide pyridinoline cross-links. Sensitive indicators of periodontal tissue destruction. Ann N Y Acad Sci 1999;878:404-12. 52. Talonpoika JT, Hamalainen MM. Type I collagen carboxyterminal telopeptide in human gingival crevicular fluid in different clinical conditions and after periodontal treatment. J Clin Periodontol 1994;21:320-6. 53. Nakashima K, Giannopoulou C, Andersen E, Roehrich N, Brochut P, Dubrez B, et al. A longitudinal study of various crevicular fluid components as markers of periodontal disease activity. J Clin Periodontol 1996;23:832-8. 54. Sharma CG, Pradeep AR. Gingival crevicular fluid osteopontin levels in periodontal health and disease. J Periodontol 2006;77:1674-80. 56. Mahmood S, Kawanaka M, Kamei A, Izumi A, Nakata K, Niiyama G, et al. Immunohistochemical evaluation of oxidative stress markers in chronic hepatitis C. Antioxid Redox Signal 2004;6:19-24. 58. Takane M, Sugano N, Ezawa T, Uchiyama T, Ito K. A marker of oxidative stress in saliva: Association with periodontally-involved teeth of a hopeless prognosis J Oral Sci 2005;47:53-7. 59. Battino M, Ferreiro MS, Gallardo I, Newman HN, Bullon P. The antioxidant capacity of saliva. J Clin Periodontol 2002;29:189-94. 60. Terao J, Nagao A. Antioxidative effect of human saliva on lipid peroxidation. Agr Biol Chem 1991;55:869-72. 61. Moore S, Calder KA, Miller NJ, Rice-Evans CA. Antioxidant activity of saliva and periodontal disease. Free Radical Res 1994;21:417-25. 62. Hu S, Arellano M, Boontheung P, Wang J, Zhou H, Jiang J, et al. Salivary proteomics for oral cancer biomarker discovery. Clin Cancer Res 2008;14:6246-52. 63. Li Y, St John MA, Zhou X, Kim Y, Sinha U, Jordan RC, et al. Salivary transcriptome diagnostics for oral cancer detection. Clin Cancer Res 2004;10:8442-50. 64. Hu S, Wang J, Meijer J, Ieong S, Xie Y, Yu T, et al. Salivary proteomic and genomic biomarkers for primary Sjogren's syndrome. Arthritis Rheum 2007;56:3588-600. 65. Hu S, Xie Y, Ramachandran P, Ogorzalek Loo RR, Li Y, Loo JA, et al. Large-scale identification of proteins in human salivary proteome by liquid chromatography ⁄ mass spectrometry and two-dimensional gel electrophoresis- mass spectrometry. Proteomics 2005;5:1714-28. 66. Denny P, Hagen FK, Hardt M, Liao L, Yan W, Arellanno M, et al. The proteomes of human parotid and submandibular ⁄ sublingual gland salivas collected as the ductal secretions. J Proteome Res 2008;7:1994-2006. 67. Li Y, Zhou X, St John MA, Wong DT. RNA profiling of cell free saliva using microarray technology. J Dent Res 2004;83:199-203. 68. Ballantyne J. Validity of messenger RNA expression analyses of human saliva. Clin Cancer Res 2007;13:1350;author reply 1351. 69. Nussbaumer C, Gharehbaghi-Schnell E, Korschineck I. Messenger RNA profiling: A novel method for body fluid identification by Real-Time PCR. Forensic Sci Int 2006;157:181-6. 70. Gottfried TD, Mink RW, Phanuphak P. Calypte AWARE HIV-1/2 OMT antibody test using oral fluid: Special challenges of rapid HIV testing in the developing world. Expert Rev Mol Diagn 2006;6:139-44. 71. Jones JP. In the culture of now: The arrival of the OraQuick rapid HIV test. Posit Aware 2004;15:35-6. 72. Donovan BJ, Rublein JC, Leone PA, Pilcher CD. HIV infection: Point-of-care testing. Ann Pharmacother 2004;38:670-6. 73. Reynolds SJ, Muwonga J. OraQuick ADVANCE Rapid HIV-1/2 antibody test. Expert Rev Mol Diagn 2004;4:587-91. 74. Schipper R, Loof A, de Groot J, Harthoorn L, Dransfield E, van Heerde W. SELDI-TOF-MS of saliva: Methodology and pre-treatment effects. J Chromatogr B Analyt Technol Biomed Life Sci 2007;847:45-53. 75. Major CV, Read SE, Coates RA, Francis A, McLaughlin BJ, Millson M, et al. Comparison of saliva and blood for human immunodeficiency virus prevalence testing. J Infect Dis 1991;163:699-702. 76. Griffiths GS. Formation, collection and significance of gingival crevice fluid. Periodontol 2000 2003;31:32-42. 77. Miller CS, Foley JD, Bailey AL, Campell CL, Humphries RL, Christodoulides N, et al. Current developments in salivary diagnostics. Biomark Med 2010;4:171-89. 78. D'Aiuto F, Ready D, Tonetti MS. Periodontal disease and C reactive protein-associated cardiovascular risk. J Periodontal Res 2004;39:236-41. 79. Teng YT, Sodek J, McCulloch CA. Gingival crevicular fluid gelatinase and its relationship to periodontal disease in human subjects. J Periodontal Res 1992;27:544-52.